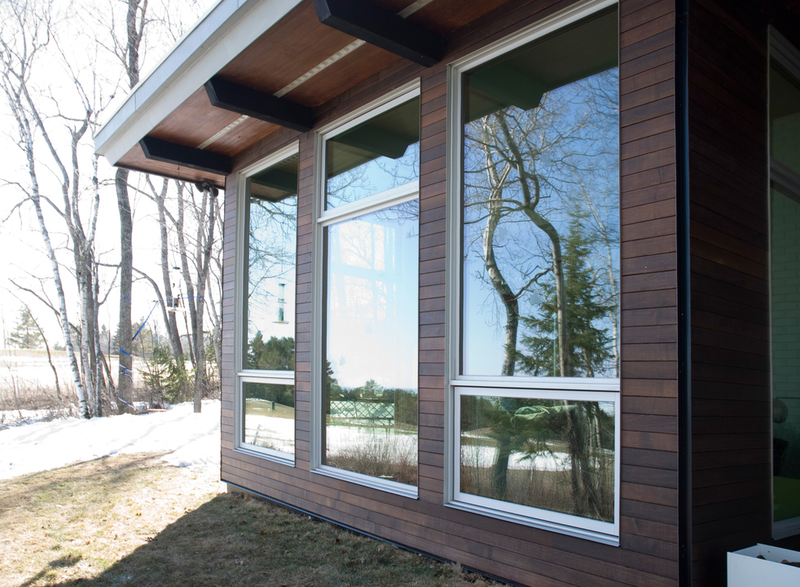 Wood siding doesn’t have to be boring, and it could easily be argued that it is one of the most versatile types of siding. While wood is often thought of as a warm, rustic type of material there are plenty of modern home design ideas that can be applied with this Siding Toronto. A common issue with wood siding is the maintenance involved, which is often a reason homeowners opt for a synthetic or hybrid siding. If you fall into this category but just can’t shake how much you love the look of wood consider mixing wood siding with another material. Vinyl is a popular siding and you can create a beautiful look by combining vinyl and wood. There are also plenty of other materials you can choose. Wood is very flexible in how it can be used and compliments almost everything. Similarly to using another material, another option to still get the beauty of wood without as much work is to elevate the wood siding up on the wall. A common example of this is combining (faux) stone and wood. You can do this combination on one or two story homes. One story homes can really benefit from this elevated siding as it visually makes the home look taller. A simple way of giving wood siding a unique look is to simply use thinner boards than usual. This is fairly easy for a contractor to do but really gives the home a fresh appearance. Thin board wood siding can either look very modern or quite rustic, depending on the look you want your home to have. You can also go vertically with thin boards. Typically people choose either vertical or horizontal wood siding but, for some reason, fail to consider the idea of alternating different directions within the entire exterior. This may seem intimidating but, when done right, yields beautiful results. You can also get really creative with alternating board directions, such as incorporating diagonal boards. Modern home design is all about lines, but round buildings also fall into this category. The problem with round buildings is figuring out siding that looks good. For many, this means choosing some type of stucco-like material for the exterior of round homes or round additions. But this isn’t the only option. Instead, you can use vertical wood siding, which not only looks spectacular on round structures but is also much easier to install. Not to mention vertical side will help one story round buildings look taller. A large part of the attraction of wood is its natural colour and grain, as well as how it weathers to a nice grey patina with age. Not everyone wants this though, and for those that like wood but also like the colour options of vinyl and other alternative materials, simply painting their wood siding is a happy medium. You can really get creative with bold accent paints on wood, so you can enjoy colour as well as natural wood warmth. Just like you can plan with thin or thick boards you can also play with the size of large wood panels. Since modern home design often incorporates very clean lines and blocks, wood siding is a perfect material to use. You can either use the same size wood panels in the home or, if you really want an unusual look, use different sized panels. Another option is not using simple square panels but just alternating a shingle pattern. There are some very unique shingle siding options for homes. You can find designs like diamonds, scales and more. These types of patterns often give the home a mythical, fairy tail feel rather than modern, though the diamond pattern can certainly look upscale as an exterior accent wall. If you live in a region that gets a lot of rain you may already be aware of the importance of rain screen. Rainscreen is a membrane that goes between siding and the exterior wall and helps shed water away more effectively. If you live in such a region and are hesitant to try wood, consider using a modified wood for siding. Getting rid of that old vinyl and switching to wood siding is a huge transformation that will increase value, without decreasing your home’s weather-resistance. You can also combine a rain screen with modified wood for maximum protection. Instead of using wood as trim, think about adding metal trim instead. Not only is metal trim more resistant against weather and moisture, but it also looks very rustic and attractive. If you really like the look of metal you could expand this further by doing half-wall metal panels with the wood siding. Wood might not be considered the most modern material but it remains one of the most popular and prized. The maintenance involved in caring for wood siding properly is often of little concern for homeowners that want a truly unique home. These 10 modern home design ideas for wood siding featured here are just the tip of the iceberg when it comes to how you can work with this organic material. Care for a Kahrs Wood Flooring?